Ben is working hard on properly maintaining all aspects of his overhead squat. Collectively, our participants lost 40 pounds and over 55 inches! Also, everyone improved their benchmark times by at least 10%. That is awesome! I also want to give a huge shout-out to Caigen! He had one of the most radical physical transformations. He also had a 34% performance increase. Keep up the hard work!! Thursday – Gym is closed. WOD is GJ 5K Turkey Trot. 9am start. Start and finish at Soar Physical Therapy, 2497 Power Road, in Albertson’s shopping complex on Redlands. Autumn has generously donated some delicious Starbuck’s coffee for all CrossFit Junction participants. We will have this on hand for you before and after the event. Thanks Autumn!! Did you know you can compete in CrossFit? 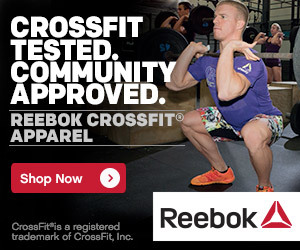 For those of you that are pretty new to all of this, I highly encourage you to check out www.crossfit.com. You can watch videos of any exercise we do and read some great material. Spring is when our competition season rolls around. CrossFit stands on the concept of “unknown and unknowable” so planning for next year is hit or miss, but this year our Sectionals were in March (’10) and registration opened in late December (’09). So….. it’s about that time to commit again. If you are interested, talk to one of us. Perhaps this is your time, perhaps another year of getting stronger and gaining more confidence would be more beneficial for you. Tyler and I will be competing, so should you decide against giving it a go this year, we would L-O-V-E to bring a supportive crew (like…. all CrossFit Junction members!!) with us! So, put that on the books. Sometime in March, somewhere. Check. Justin, get with me at the gym for my home address, that way you’ll know where to send my “Finder’s fee” for bringing you to the gym. It’s like when you win the lotto, suddenly you have lots of friends. All jokes aside, you’ve done a great job and have certainly exceeded all expectations of how far along I thought you would be at this point. You’ve proven to be a great additional member to the wolfpack.